Dark and monochromatic handbags are very much the norm for many style hunters. And it’s easy to see why as they often pair well with most outfits in any given wardrobe. A black or navy handbag matches nearly any blouse, jacket, and pants. It’s not unusual to see a sea of black handbags and carryalls in offices, airports, train stations…well, nearly everywhere. We love black in the fashion world and it definitely has its place. However, sometimes it’s great to explore boundaries outside of the norm and what feels safe; especially when it comes to what we carry. Yes we are in the midst of winter, but what a great time to consider brightening up our handbags for spring. We thought of a few tips that may be helpful when choosing a colorful handbag or one with a louder print than you currently own. When choosing a new handbag, especially one with a solid bright color or a fabrication, it’s important to take the size into consideration. Do you want a small handbag, a tiny clutch or a larger shape such as a satchel? It’s important to keep in mind that brighter colors stand out more. A bright pink handbag you carry during the day will *pop* more than a black, navy, or brown bag. If you have never owned a colorful handbag, often smaller clutches are the way to go. A minaudière or little bright leather clutch is not as noticeable as a large bag, but it often provides just the right amount of color without being too showy. For example, if you are wearing a bright pink party dress for an evening soiree, then an aqua clutch with splashes of purple would be a great medley of colors without being overbearing. Look at some of the most famous designers; they often combine many different color palettes in one item. They make it work and customers love it. If you are a bit skittish to carry a colorful handbag, start with a smaller size. On the opposite end of the spectrum there are those fashionables who are not afraid of bright color and wear it proudly. Many are very intuitive in wearing bright hues and know exactly how to pair their ensembles. We spotted a bright neon green backpack on a fashionista the other day and it looked very cool. Yes, the neon trend has passed for many, but fashion is all about wearing what you want and what makes you comfortable. And neon certainly is colorful. When testing the waters with colorful handbags, it’s probably best to start with a smaller size if you have never owned more than a brown or black bag. However if you feel confident and want to jump right in, go for a medium or larger satchel and even a backpack. And now there are many backpacks from designers that have a sleek and streamlined silhouette and don’t have a bulky shape as many of their predacessors. In many ways the style of the handbag goes along with size, but not one hundred percent. Different styles of handbags come in different sizes. So you could have a satchel that comes in a large, medium, small, and mini size. As to not overcomplicate, we will mention the top three main styles of handbags. First we have the clutch and within this style they range from large to super tiny. As we mentioned above, a smaller size in the clutch style would be a great choice for a a new colorful bag. Because of the style and size of a clutch, one can pull it off in the boldest of colors. The second main handbag style is the tote. Nearly every woman owns a tote. Whether it’s a basic tote with an open top you carry to the beach or something a bit fancier such as a full leather version with studs, this ubiquitous style can be found in many wardrobes across the globe. A tote style of handbag is popular in part because of its ease of use. It’s so easy to carry a tote over your shoulders without fee constricted. Most totes are designed and crafted with handles that fit over the shoulders. And for those totes with smaller handles to be carried by hand, they usually come with d-rings sewn to the side and a longer detachable shoulder strap. The detachable strap may be carried in crossbody or over the shoulder. If you love the tote style of handbag, it’s very easy to find them in various colors and prints. Because this style is so popular, designers are known for churning out totes in bold and bright hues. The tote is a great style to purchase in a super bright color; especially for summer. And a tote in a bold pop of color brightens up even the greyest of winter days. Let’s also not forget how much interior space a normal to large tote provides. If you are a busy buzzing from work to dinner, it’s the ideal style for many as it holds daily essentials such as a laptop, magazines, papers, etc. Many designers line their totes with various sized pockets making it a perfect way to store smartphones and chargers in an orderly manner. A bright blue tote would be a good choice for work. It’s not too loud of a color, but still enough of a pop to make a difference. A third style of handbag is the satchel. Satchels are also incredibly popular; especially for busy businesswomen and travelers. Just like the other two styles, satchels come in a variety of sizes. From large to micro-mini there is a style of satchel for nearly every chic girl about about town. A large satchel in bright neon yellow may be a bit too much for most, but it wouldn’t surprise us if several style stars could pull it off. Study an assortment of street style photos and you will notice many of the chicest subjects are carrying satchels. This particular style of handbag reached cult status recently with trendsetters. It’s easy to see why satchels are so popular. In medium to large styles, you can put so much inside and unlike most open topped totes, the satchel closes in some way whether it’s with a single turncock or a flap that buckles in the front. In a way, the satchel style is timeless in a very modern world. We will always have things to carry throughout the work week so why not carry these necessities in the chicest way possible. Satchels provide plenty of room to play with color. Think of all of the mini and micro-mini satchels popping up online and in stores; the style of the bag and small shape pair perfectly with bright color. Even better would be a mini satchel in bright metallic color. Metallics and and color go well together. And if you choose a satchel with a flap, many designers love to play around with two different colors on one bag. For example, a satchel with a body in a bright color and a black flap lets you have the best of both worlds; the fun pop of color and the more traditional hue that feels a bit safer. The third and final tip to choosing a colorful handbag is the color itself. Once you have narrowed down the size and style, you need to decide what format of color you would like to add to your wardrobe. For example do you want to purchase a solid color or perhaps you would like to integrate color through a print. One bold single color often makes a big fashion statement. A bright baby blue leather tote would transition perfectly into spring. A bold purple satchel with black leather trim would be work appropriate. Colorful without being obnoxious. And we mentioned above a neon backpack. We are currently coveting a small, leather neon, any neon will do, backpack for summer. It’s also good to keep in mind that some colors are more neutral than others. Shades of blue for instance are more neutral than fluorescent green. If you have only owned black and brown designer handbags, then you will have to decide if you want a new colorful handbag in a soft or mute tone or if you want to go full on fluorescent bold neon. And if you have the budget, you can add several different color variations to your handbag wardrobe. Perhaps one season you buy a light green clutch and the next season you acquire a ruby red tote, over time you will have a good selection from which to choose. It’s also easier to incorporate colorful handbags into your daily wear in solid colors. Don’t get us wrong, we love prints, but a loud print in several different colors shouts more than a bright solid, single color. Prints, however, are very in style this season and also as we move into spring and summer. We recently previewed some new colorfully printed handbags. The prints were nice and the color combination used weren’t overly loud. Floral prints seem to always be in during appropriate seasons and there is no reason why you couldn’t purchase a handbag in a beautiful floral print. There is a very popular micro floral-print trend happening at the moment. Celebrities such as Victoria Beckham and Kate hudson have been photographed in small, beautiful florals. Many of these micro floral-prints are very colorful, but because the print is so tiny, it’s the perfect pop of color. Micro floral-prints are subtle yet resplendent. The tiny petals on many of these small printed florals are simply delightful to the eye. And these aren’t dull, subdued blooms. Instead they are modern and often in bright pinks and greens which makes their small shape simply pop and stand out in a good way. Many of the micro floral-prints also have futuristic sheens to them so from one direction you can see a blue bloom and then from another angle it’s red or green. And with pops of bright colors thrown into this trend, it’s most certainly not your grandmother’s floral. If you are going to purchase two new colorful handbags may we suggest you add one in a solid color and another in a print such as one of the new florals. We also love some of the colorful prints with fruit. They remind us of Flemish still life paintings. 1.) Size – Figure out if you want your new colorful handbag to be a small clutch or a larger handbag. Think of the ways you will carry your new handbag. If you are a bit skittish to add a new handbag in a bright color, start with a small size and work your way up. 2.) Style – Take the style of a handbag into consideration. Would you prefer your new handbag to be a tote, a satchel, or perhaps a clutch? 3.) Color and Print – Do you prefer to purchase a handbag in one solid color, several colors, or a print? Think about how you would incorporate the new colorful handbag into your wardrobe. A solid color may go with more compared to a print. But then again a printed handbag is super chic in certain patterns and an added bonus to any wardrobe. Print this article to keep by your laptop when you shop online and keep it on you when shopping in a store for your new colorful handbag. We’d love to see your new additions and what you choose when buying a new colorful handbag. Send us pics! 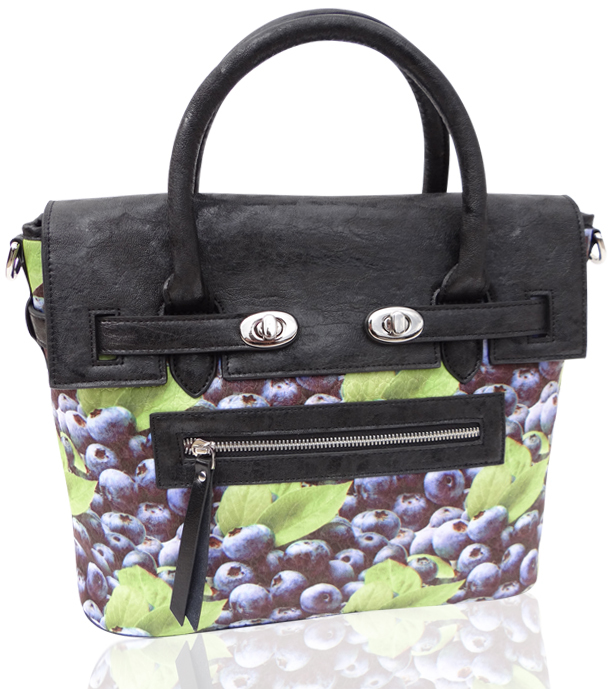 You may also browse PLIA Designs collections of designer handbags. We have a selection of colorful designs and also several with vibrant prints.